Visitors test out new tools at Mecanex 2017. 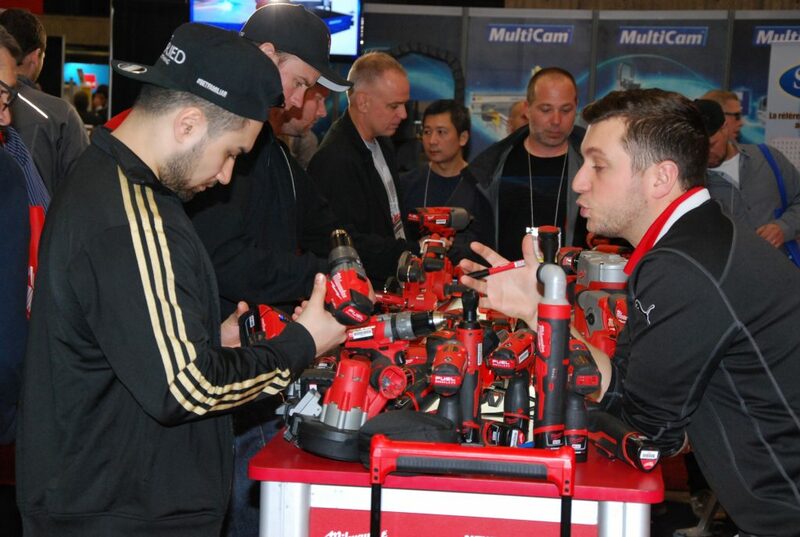 Organizers are expecting a sold-out exhibit hall when MCEE 2019 returns to Place Bonaventure in Montreal April 24-25. By early January 364 of the 400 exhibitor spaces had already been booked. The show will feature a full range of new products including heating, refrigeration, air conditioning, plumbing, hydronic heating, tools, software, trucks and accessories, backflow, and other industry-related equipment. As well, there will be a full range of electrical products. Seminar topics and speakers at MCEE (Mecanex/Climatex/Expolectriq/Eclairage) have already been announced. There will be 22 free seminars over the two-day show covering topics in plumbing, hydronics, HVAC/R, electrical and lighting. All will be presented in French. Many exhibitors will enter their latest innovations in the New Product Showcase competition, which will be judged by a panel of experts. Those products will be on display throughout the show. Judges will also choose an overall grand prize winner for the most innovative new product at MCEE 2019. All visitors will receive ballots for the four MCEE door prize draws. Two iPad Pros and two Bose Home Speaker 500s will be awarded. More than 6,000 industry visitors are expected to attend. MCEE is produced by the Corporation of Master Pipe Mechanics of Quebec (CMMTQ), the Canadian Institute of Plumbing & Heating (CIPH), the Corporation of Master Electricians of Quebec (CMEQ) and the Corporation des enterprises en traitement de l’air et du froid (CETAF). Visitor registration is free until April 23. Show hours are April 24 from 10 a.m. to 7 p.m. and April 25 from 10 a.m. until 4 p.m. Please visit www.mcee.ca for more information.